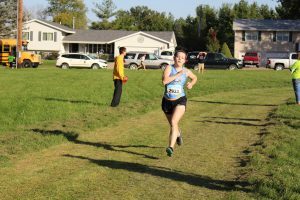 Lynnville-Sully’s Mary Kate Shaver is headed to state after edging herself into the top 15 at the state-qualifying meet in Ottumwa last Thursday, Oct. 19. The senior also helped lead the girl’s team to a solid fifth-place finish out of 11. Shaver got out with the top 10 early in the race, crossing the one-mile mark in 12th. “She understood what it was going to take to make that top 15 and get to state,” said L-S Head Coach Darin Arkema. Senior Mary Kate Shaver gives her all at the state-qualifying meet last Thursday. Shaver punched her ticket to state by placing 15th. Overcome by heat, Shaver passed out a few minutes after her race, but quick thinking by L-S parents and a few strangers got ice and water to her to cool her down and revive her. With 400 meters to go, Shaver was in 15th with a runner trying to catch her. Giving it all she had, she sprinted to the end and punched herself a ticket to state in a time of 22:19. The L-S girls earned fifth, two spots from qualifying for state. A highlight for them was beating conference champ Colfax-Mingo. The L-S cross-country team at the state-qualifying meet. Freshman Megan Van Zante was just five places from a spot to go to state. Van Zante placed 20th and crossed the finish line at 23:13 after a tremendous final kick over the last 150 meters. Behind her was sophomore Abby Gruver in 35th, running the race in 24:13. 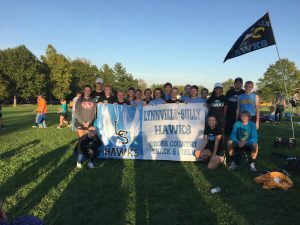 A pack of L-S runners, junior Emily Van Gorp (24:57, 41st), sophomore Abigail Davis (25:03, 43rd), and senior Christine Nikkel (25:11, 45th) were the difference makers that led to the victory over Colfax-Mingo. Senior Haley Breeden ran the last race of her career, placing 55th with a time of 26:08. The top school in the girls’ race was Hudson, followed by Denver, Pekin, and GMG. 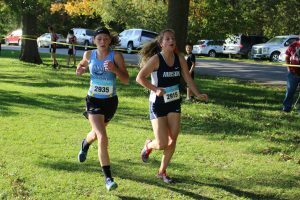 Freshman Megan Van Zante battles a Hudson runner on the course in Ottumwa for the state-qualifying meet last week. Van Zante placed 20th, five short of qualifying for state. 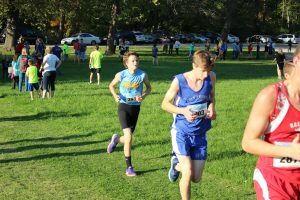 Like he has done all year, senior Josh Dunsbergen led the L-S boys team and ended his career after a hard-fought race. Despite getting caught in the middle of the pack early on, Dunsbergen earned himself a time of 19:37, placing 40th. Senior Josh Dunsbergen leads the L-S boys at the state-qualifying meet, placing 40th. Junior Joseph Anderson ran his best race of the season in 20:33 and placed 52nd. Not far behind him was freshman Mason Jansen in 20:48, earning 58th. Sophomore Blaize Kuhlmann also ran one of his best races of the season, placing 76th in 21:47. Freshman Luke Kramer finished strong in 25:15 and placed 111th. The team totalled 288 points and placed 15th. Pekin won the meet. Junior Joseph Anderson puts up his best race of the season at the meet last Thursday. Now that the season has come to a close for all but one, the focal point of the team shifts to supporting Shaver at state. 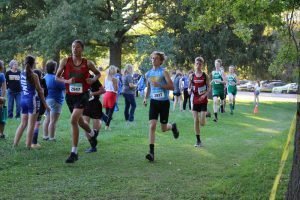 She will run at 2 p.m. on Saturday, Oct. 28, at Kennedy Park by Fort Dodge.